The Oklahoma City Thunder went on a 14-0 fourth-quarter run to beat the Dallas Mavericks on Monday night, 92-91. Human lightning bolt Russell Westbrook scored 12 of those 14 points—including the game-winner with seven seconds left. Oklahoma City was down 91-78 with 3:30 left on the clock when Westbrook turned on the afterburners and hit nearly every shot he took. 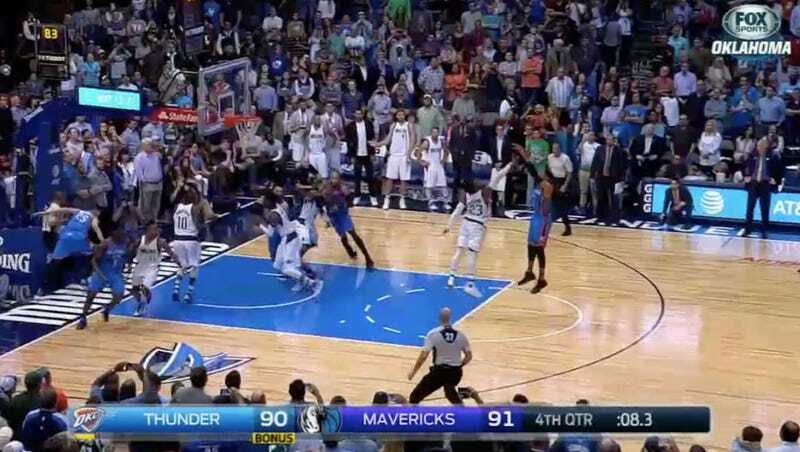 In the final 20 seconds, with the Thunder trailing by one, Westbrook missed a jumper, but then the Mavs turned it over on the next play. The next trip down the floor, Westbrook didn’t miss and he got to celebrate on the Mavs’ court after Harrison Barnes’s last-second three-pointer clanked off the rim.